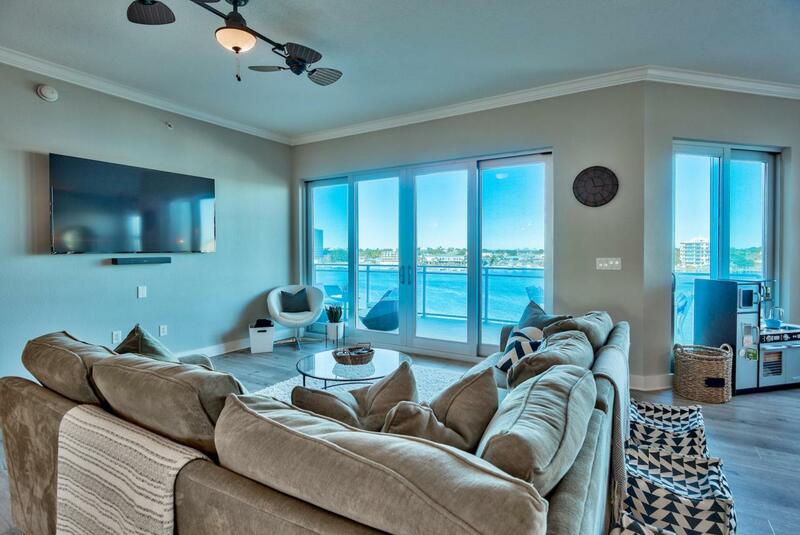 Stunning must see 3-bedroom, 3-bath Harbor front condo at Harbor Lights, a gated, prominent 7-story condominium nestled on the Destin Harbor with incredible amenities and views. This renovated, luxurious unit is being sold fully furnished with contemporary decor. 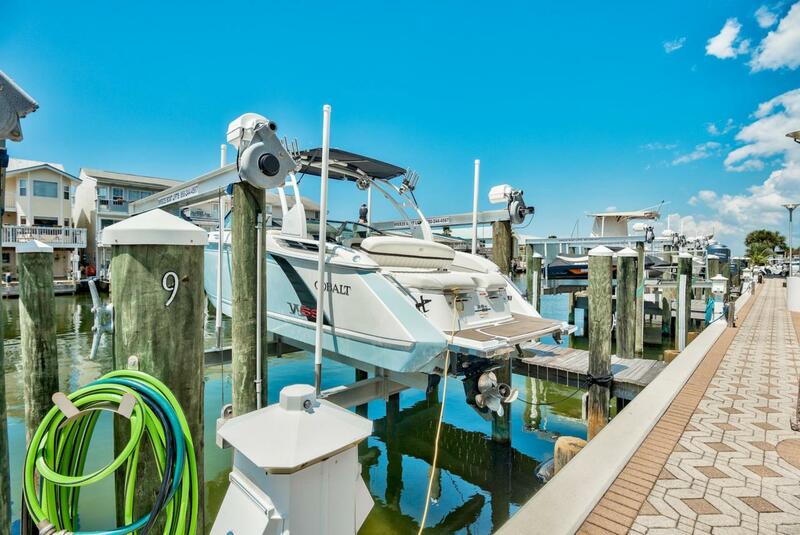 You have an option to purchase a boat slip with lift, private garage space, and a private climate controlled storage unit for an additional expense. This desirable floor plan is the highly coveted middle unit offering two entries - you can conveniently access from both the east and west elevator. There is definite pride of ownership and the property has been impeccably maintained. Upgrades include new flooring & paint throughout, new upscale light fixtures & fans, custom dining room bar, fully updated master bath & wood accents!Enjoy not one but two balconies with incredible views. The harbor front balcony can be accessed from the living area and master bedroom and is expansive in size with beautiful glass railing that maximize the views - there are only 8 other units in the building that offer this! The balcony is the perfect place to entertain, outdoor dine and watch the boats come back from a day of fishing. 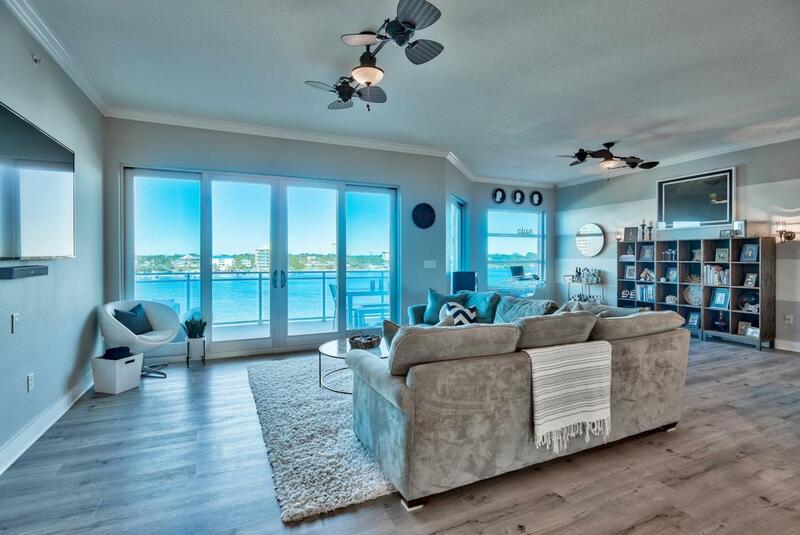 Enjoy views of the harbor all the way to the Destin bridge. The second balcony is shared by the two guest bedrooms and faces south overlooking the canal, Gulf of Mexico and East Pass. This is truly rare and exceptional for the guest bedrooms. All three bedrooms also feature en-suite bathrooms and the split floor allows for even more privacy. This is a quiet and tranquil building with only 39 units in the building, no short term rentals, added sound protection between shared walls and a newly gated community (2019). You are in a prime location near all of the action but don't have all the hustle & bustle of high rise condo living. Additional interior features include crown molding in the main living areas & master bedroom, 10 foot ceilings, recessed and custom lighting, open floor plan and large glass windows and doors to maximize the views and bring in abundant natural light. This is a relaxed yet elegant living space with beautiful furniture, smart technology and flat screen TVs with hidden cables for a polished look. The kitchen forms the centerpiece of the space and features a huge granite top breakfast bar, chef's sink, stainless appliances, and custom cabinetry. This dream kitchen is accented by recessed lighting surrounding the custom wood-accented tray ceiling and additional details like the tile backsplash. There is plenty of storage with the ample cabinets and separate walk-in pantry. Capture views of the harbor while preparing meals or dining in the impeccably styled modern dining area with added custom bar and new modern lighting. The master bedroom is harbor front with direct balcony access, stunning views, crown molding, a huge walk-in closet, and stunning en-suite master bathroom. The room is very spacious with a king bed and flat screen TV. The incredible en-suite master bath has been fully renovated featuring subway tiles with a soaking tub and separate shower with duel waterfall shower heads, recessed lighting, new cabinetry and double vanities with granite countertops. Each of the additional bedrooms are are also generous in size with direct balcony access. This home is literally surrounded on all sides by incredible views of what makes Destin such a magical place to live. This home is being sold fully furnished and is move-in ready. There is an option to own a deeded boat slip, so that you may truly enjoy all the wonders of the Emerald Coast and the "World's Luckiest Fishing Village". Within minutes of boarding your boat, you can enjoying the Gulf of Mexico, the Choctawhatchee Bay and the popular Crab Island. Don't forget the private garage and a storage unit to hold all your adventure gear. This is the perfect location to enjoy all the Emerald Coast has to offer. Parks, preserves, attractions, beaches, upscale shopping, fine dining and renown nightlife... all within minutes from your door. There is even a water taxi to bring you to your favorite waterfront dining & entertainment options nearby. At Harbor Lights, you will be impressed from the moment you step foot on the grounds. Once you pass through the lush entrance to the property, you will see the great detail of the exquisite landscaping. There is a beautiful 2-story lobby area accented by three custom mosaic tiled walls with unique glass artwork, high speed glass elevators, and two spiral staircases leading up to a common area highlighted with a kitchen, living room, recreation area with pool table, and balcony overlooking the harbor. Take advantage of the harbor front park area, owner's lounge, or relax in the free form pool that can be found on the ground level and is accented by tropical landscaping and paver pool deck. The pool has multi-color fiber optic lighting that accents the contemporary design of the building at night. There is a hot tub to unwind in and lounge chairs to enjoy. Adjacent to the pool is a fully equipped fitness center with a separate men's and women's locker room each with a dry sauna and steam room. There is even a gated dog area for your beloved pets. The HOA is in great shape and financials are current within the development. The building exterior is freshly repainted. 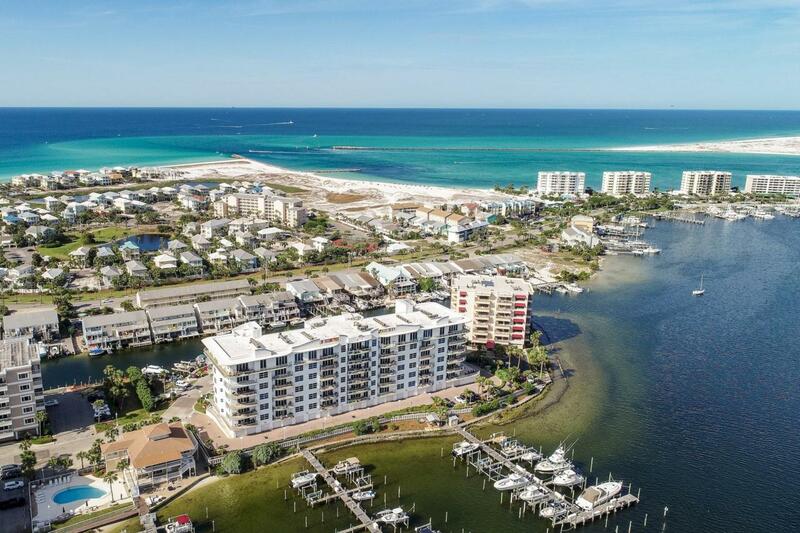 Do not miss out on this opportunity to own an exceptional unit on the coveted Destin Harbor!